What is the Best Car Sun Shade? 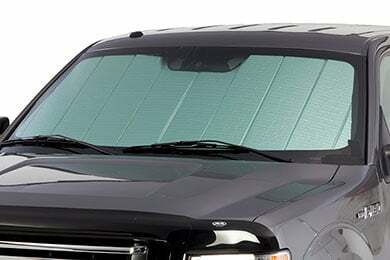 Explore the best windshield sun shade for your ride. Sun shades are one of the simplest, and most effective, accessories to protect your vehicle’s interior. Blocking the sun’s harsh UV rays not only helps your upholstery stay in pristine condition, it can keep your interior temperature up to 40° cooler. When it comes to choosing the best windshield sun shade for your ride, the options are almost endless. From custom accordion sun shades to universal roll-up versions, there’s a sun shade to fit both your needs and your budget. We’ve compiled the benefits of a range of car sun shades to help you decide which one is right for you. Intro-Tech’s Ultimate Reflector Car Sun Shade serves double-duty with a reflective Mylar side for deflecting heat in the summer and an absorbent felt side to keep your cabin nice and warm in the winter. The perfect accessory in any season, this premium 6-layer shade, unlike lesser quality cardboard sun shades, is designed with a custom-fit to your vehicle’s windshield. Easy to fold and store in its own bag, the Intro-Tech Ultimate Reflector is backed by a Lifetime Warranty. Perfecting the craft of covering your vehicle inside and out, Covercraft knows a thing or two about creating top-of-the-line sun shades for cars. Direct sun can turn your pristine dashboard and upholstery into a minefield of cracks, warps and discoloration. A Covercraft Car Sun Shade offers triple-layer protection and a precision-fit in your specific windshield. This folding shade is easy to store out-of-sight and comes backed by a 90-day warranty. If your idea of interior protection doesn’t require folding and unfolding every time you want to drive, look no further than the Dash Designs Original Car Sun Shade. 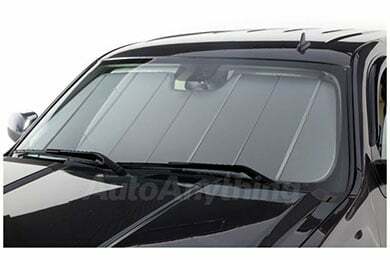 With a unique pleated design, this shade affixes to your windshield with high-temp 3M tape and mounting brackets, so when it’s time to beat the heat, all you need to do is pull the shade out and latch into place. The low-pro Dash Design Shade takes up less than an inch of windshield space when retracted and comes backed by a 2-year warranty. What Sunshade Should You Choose? Whether a universal foil shade will do or your ride deserves the best sun protection, you’ll find these shades and everything in between at AutoAnything. The best sunshade for your car is waiting for you among our vast assortment. Find plain and patterned sun shades at the best value around thanks to our 1-Year, Lower Price Guarantee and Free Shipping. This is at least the fourth Covercraft car sun shade I have purchased. All of them fit perfectly and were very durable. When individuals see it, they want to know where I purchased it. This is a very good investment to protect part of my car's interior from sun-damage and heat. This car shade is exactly what I was hoping for. Keeps the inside of the car a little cooler but, more importantly, it keeps the steering wheel cool and the air condition blows cold air almost immediately, since the dash is no longer boiling-hot. Reference # 766-178-903 © 2000-2019 AutoAnything, Inc.